In a delicate operation the clock face on one of Canterbury Cathedral’s iconic towers was carefully removed and gingerly lowered 120ft to the ground this afternoon (Tuesday 27 November 2018) prior to it heading north for a major make-over. It is 90 years since its last overhaul so the Cathedral has taken advantage of the current scaffolding to bring it down and send it off to clock specialists in Cumbria where the faded dial will be cleaned and repainted and the Roman numerals and hands regilded. 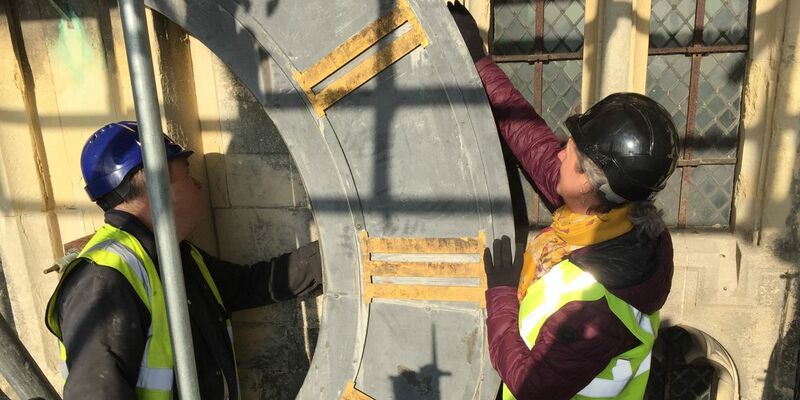 Measuring eight feet in diameter it was due to be an awkward challenge to bring it down but a team from The Cumbria Clock Company with the Cathedral’s own workforce successfully took it from the wall and lowered it down the Cathedral’s west front. The clock mechanism is joining the dial on the journey to the restoration specialists. It is considered one of the finest examples of workmanship by clock makers G.F. Vale of London. Made in 1855, it was converted in the 1980s to be driven by electric motors. These are now to be stripped out and the mechanism restored to a pendulum movement as most of the original movement parts were kept by the Cathedral. It will, however, be fitted with an automatic wind mechanism. The absence of the clock dial will allow vital work to be carried out on surrounding stonework on the west towers, currently the focus for The Canterbury Journey restoration project. The down side of having no clock or mechanism is that one of the Cathedral’s most well-known bells, Great Dunstan, will be largely silent and will not be heard striking the hour or being rung for services. Bell Harry in the central tower will take over as the call-to-service bell during the 18 months that the work on the clock is expected to take. The Cathedral bell ringers will be able to ring other bells following a short break to allow the restoration work to take place. The cost of cleaning the dial is being met by The Canterbury Journey project and the cost of restoring the mechanism by a donation from The Guy and Elinor Meynell Charitable Trust. The Trust has been a generous supporter of the Cathedral since 2013 through The Friends of Canterbury Cathedral. Above Heather Newton and Mark Crangle from The Cumbria Clock Company discuss the removal of the clock from the South West Tower.